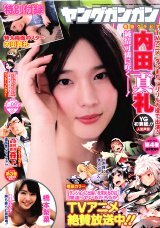 The cover has photo of Uchida Maaya (内田真礼). There is a 8 page photo collection of Maaya at the front of the magazine. Maaya wears three different outfits. Some of the mail in presents for this issue were Maaya goods, such as a QUO card and three signed cheki (small polaroids). Maaya also had a 6 page photo collection in the previous issue of Young Gangan (2015 No.08). This magazine also came with a arge two sided poster of Maaya, which was folded. Opened, the poster is a little smaller than B2 size.